If you were missing teeth in the past, you had a limited number of viable choices. You could choose to do nothing, which is never a good idea, or you could choose to have bridges or false teeth. While implants were around, it was only relatively recently that dental implants advanced to the point where they became a good choice. It is a good restorative dentistry option for many people, and it could be right for you, as well. The dental implants can do a great job of providing your mouth with the aesthetic beauty that you want, as well as the function that you need. When you undergo implant dentistry, you do not have to worry about your teeth shifting in your mouth, which could cause problems with your bite. The post will go right into the gums and the jawbone. It will then fuse with the jawbone and become a stand-in for your natural tooth. The dentists will then add a crown to the implant, which looks just like a regular tooth. The implants look so natural today that no one will know that you even have an implant. When you have your new tooth, you will be able to eat all of your favorite foods, even tough foods like steak and apples that you might have thought were gone from your life forever. Of course, the dental implants also can provide you with greater self-confidence. You will once again be able to smile with pride. It could be the ideal choice for you and your teeth. 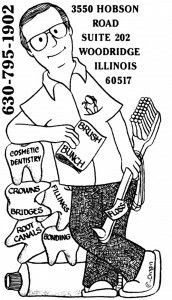 Contact our dentists in Woodridge today. You can call us at 630-795-1902 or through the contact page. We are ready to answer your questions about implant dentistry so you can have a better idea of how they can help you.